A kitchen is a place where all lip-smacking delicious dishes are cooked. For many people, their kitchen is a laboratory where they experiment with different kind of cuisines. As your kitchen it one of the most important places in your house it should be clean and well kept. The way you keep your kitchen also has a great amount of impact on that way people view you. Many people will make speculations about your personality based on the condition of your kitchen. Whether you care about others or not it’s quite sure that you’re interested in maintaining your kitchen. This starts with getting the right kind of environment in it. Smoke and other vapors can make your kitchen dirty. The solution to this problem is, however, an exhaust fan. As it is about you and your food we think that you should get the best. 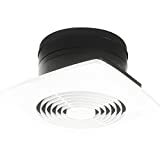 We have curated this list of the top 10 best exhaust fan for a kitchen in 2019. It’s for sure that this list will help you to find the best product that suits your requirements. 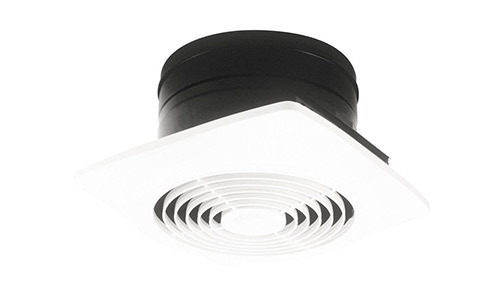 Perfect for all modern kitchens this exhaust fan is compact and powerful. With a CFM rate of 180 and 6.5 Sones, this exhaust fan provides a convenient way for driving air from a kitchen of normal size. 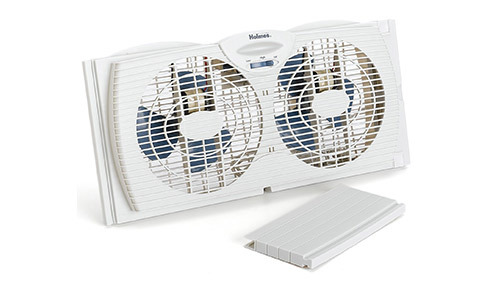 Specially designed polymeric fan blade drives air at a fast speed. It has an on/off rotary switch which means you do not have to go to the other end of the wall and put on another switch. For providing an efficient way to use its energy it hosts a built-in damper that minimizes back drafts. This will help you to eliminate cooking fumes from the kitchen. Featuring rugged steel housing with a modern profile on outer weather hood provides added strength and ensures the durability of the product. The motor inside this exhaust fan is permanently lubricated and thermally protected for life-long service. This is one of the best exhaust fans available in the market. 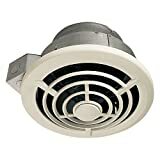 A made in USA product, this exhaust fan features a heavy-duty stainless steel construction and is designed to keep your kitchen clean and refreshed. Available in 4 sizes you can get the perfect one for your kitchen. This size measures 30-inch and it installs non-ducted with charcoal filter. You can connect a 75W bulb to the cook-top and the protective lens will distribute the light evenly making it attractive. The removable grease-charcoal filter provides a cleaner exhaust circulation. It hosts a rocker 2-speed type fan and light control. The powerful motor of 120V throws air at a speed of 2850RPM. Attractive design features hemmed bottom and mitered sides. The white attractive color of this exhaust fan compliments modern kitchens. This exhaust fan is designed to be installed on the rood and provide direct ventilation from the upper side. 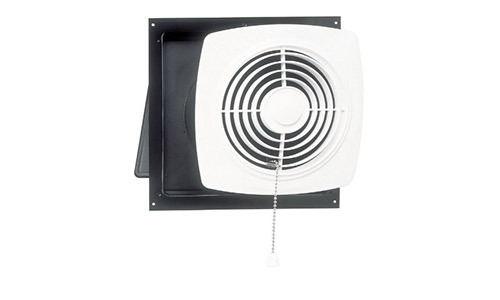 Measuring 7-inches this fan is perfect where you want a vertical ducting to be done instead of horizontal. The resin grille easily installs on the roof and can be painted to match with the look of your walls and ceiling. Its’ twist lock features easy installation in less time. Specially designed fan blades do not distort and stay balanced providing reliable ventilation for years. With a 210CFM and 6.5 Sones, this exhaust fan provides convenient air throw. 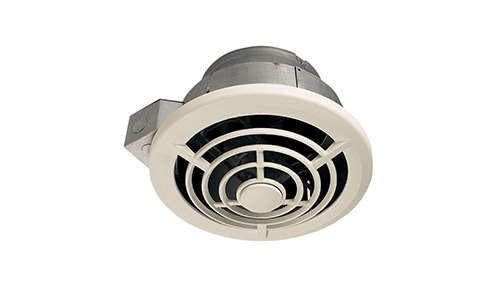 The 120V motor is thermally protected and the galvanized steel housing enhances the life of the exhaust fan. 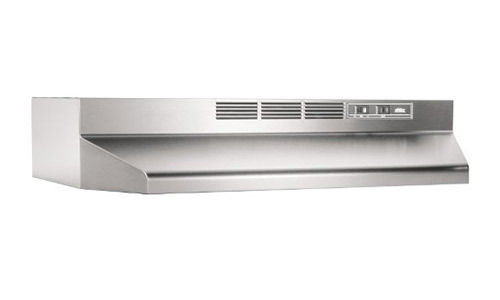 For the best of it, this exhaust fan is perfect for kitchens with an area of up to 105 square feet. 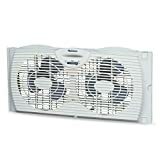 Exhaust the stale indoor air or bring in fresh outdoor air with this dual use twin window fan. Manually reverse the fan and you can throw out the cooking fumes out of your kitchen. Designed to fit in a double hung, slider and casement window you can either choose from the two-speed settings. 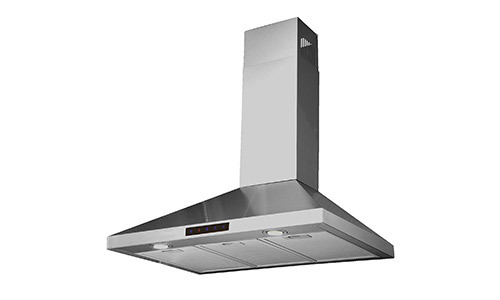 Ideal to be used for large kitchens this exhaust fan can easily in a 10-inch wide and 36-inch wide window. The 6-inch blade delivers a powerful output in large space. A slim design with water-resistant motors makes it safe for you to use this exhaust fan even in rainy season. For the best of it, this product comes with a 1-year limited warranty. A quality product from Panasonic this fan features an air blow of 290CFM. To provide durability to the fan the housing is engineered from heavy-gauge galvanized is painted for rustproof steel that goes on for years. Its built-in damper prevents backdraft that prevents air from the other side to get inside. The electrical configuration of the condenser motor is designed to operate at low temperatures and increases the life of the motor and bearings. 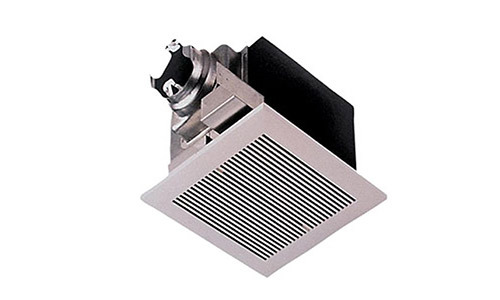 Confident with the quality of the product, the manufacturer provides a 3-year warranty for this exhaust fan. With a view to building quality and construction, this is, however, one of the most trusted fans in our range. 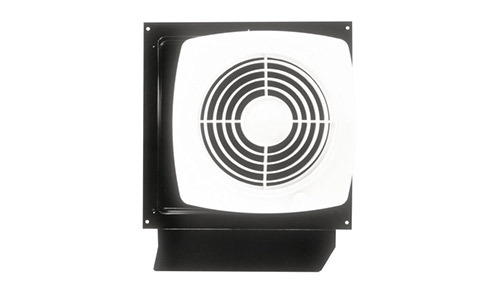 The Broan 505 is a vertical exhaust fan with a powerful 180CFM and 6.5 Sones. It easily fits in an 8-inch round duct this exhaust fan is perfect for a kitchen of about 90 square feet. With a white polymeric grille finish, this fan complements greatly with modern kitchens. Built-in damper minimizes the reverse flow of air proving an effective solution to eliminate humidity. Ensuring you the optimum benefits, this exhaust fan is HVI certified and energy star qualified to give you the energy saving user experience. This exhaust fan comes with a 1-year limited warranty offered by the manufacturer. 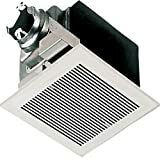 Get rid of unpleasant odors and cooking fumes from your kitchen by installing this exhaust fan. An ideal solution to provide ventilation in your home the white grille of this exhaust fan suits perfectly to the contemporary style of modern kitchens. You can paint the low profile white grilles to complement your decor. A high 250 CFM rate with 7 sones assures you of powerful air suction and effective ventilation in less time. This exhaust fan comes with a built-in damper that reduces the backdrafts. It is designed with a pull chain that opens the door and starts fan reducing your efforts to move walk to the other end of your kitchen to switch on the button. 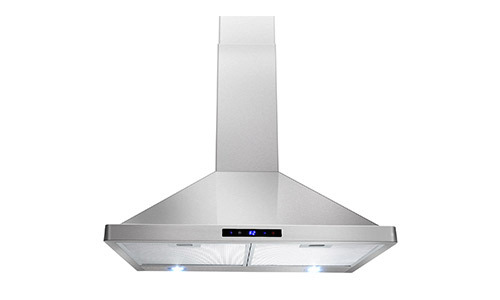 Stylish and attractive is this exhaust fan that enhances the look of all modern kitchens. Designed from high-quality stainless steel, this exhaust fan features an elegant design and a sturdy make. A high-speed fan of 400CFM can be controlled through the touch panel. Timer function automatically disables the exhaust fan after your preset timing is over. You can also monitor your cooking timings on the digital clock displayed on a small screen. With dual LED lights it impresses others by elevating the look of your kitchen. Its dual aluminum filters can be easily removed and washed with water. Proven effective results and low noise makes this exhaust the first choice for many customers. Enhance the look of your kitchen and quickly get rid of fumes and aromas during your cooking with another premium quality product. With a suction capacity of 412CFM and that too at a low noise, you can get the best out for your kitchen. Superb LED lights enhance the decor of your kitchen. The two-piece adjustable chimney looks seamless from any of the 3 sides. You can choose from the 3-speed settings the one that suits best to you. A flat touchscreen control panel lets you adjust all the functions of this exhaust fan. For a vent-less installation, this model includes charcoal carbon filters. With all these functions this exhaust fan comes with a 1-year warranty against manufacturer’s defect. 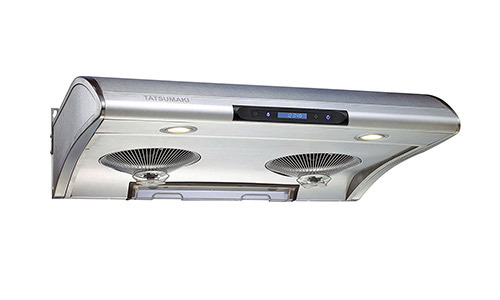 Enjoy a clean and efficient cooking experience with the Tatsumaki exhaust fan. A powerful 750 CFM ensures that all the unpleasant air in your kitchen get out quickly. Its 38-second auto-clean function improves your hygiene and does not let the grease to accumulate in your kitchen. Control all the functions of this exhaust with the display screen that is very easy to use. Its 6-speed setting lets you find the best compatible speed every time you use it. This kit also comes with a grease container and halogen lamps. So if you’re looking for a powerful exhaust then go for this one. Air Movement: For those who are out to buy their first exhaust fan, it is very important for them to know CFM. It denotes for the air flow in cubic feet per minute. The effectiveness of an exhaust fan depends on the size of your kitchen and the CFM of the fan. Sound Level: After getting an exhaust fan many complain that their exhaust sound loud and they are irritated by it. If you want to avoid that situation you should check the sound level of the exhaust fan you’re going to purchase. Sound level is measured in Sones. The lower the value of Sones the less noise it will make. Controls: There are exhaust fans that start when you put on the button and stops when you switch off the button. Others are intelligent fans with touch control panels that let you adjust the speed of the fans and other settings like light and display a digital clock. Based on your need and budget you can decide to get the one that suits best your requirements. Maintaining your kitchen is very important with a view of your health and hygiene. An exhaust fan keeps your kitchen clean by throwing out all the mixed air out and restricting the grease from getting deposited inside. Your choosing the right exhaust fan will decide the future condition of your kitchen. So a wise choice would be to select one from the best of what you can find in this list.